The Arthroleptis troglodytes, known as the “cave squeaker” because of its preferred habitat, was discovered in 1962, and not observed again for 54 years, despite several attempts to locate it. Robert Hopkins, an associate researcher with the Natural History Museum in Bulawayo and scientists Francois Becker from the University of Cape Town and Zimbabwean entomologist Scott Herbst, rediscovered the species in the Chimanimani mountain range in eastern Zimbabwe. 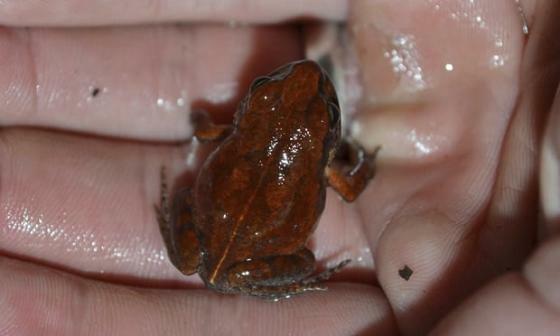 In their short communication, “The rediscovery of the lost frog: Arthroleptis troglodytes Poynton, 1963” , published in African Zoology , Volume 52, Issue 3, the authors describe for the first time the call and colour in life, and highlight several morphological and habitat features not previously recorded for this species. The typical habitat of the cave squeaker is characterised by relatively dense vegetation cover on sandy soils, and large sandstone boulders, with their call consisting of a sequence of 3-7 short, high-pitched whistles or pulses, with the first pulse lasting longer than subsequent pulses. Read the short communication at no cost until the end of December 2017 here . To read more about African Zoology, view other papers that have recently been published as well as information on how to subscribe to the journal view the NISC website here.